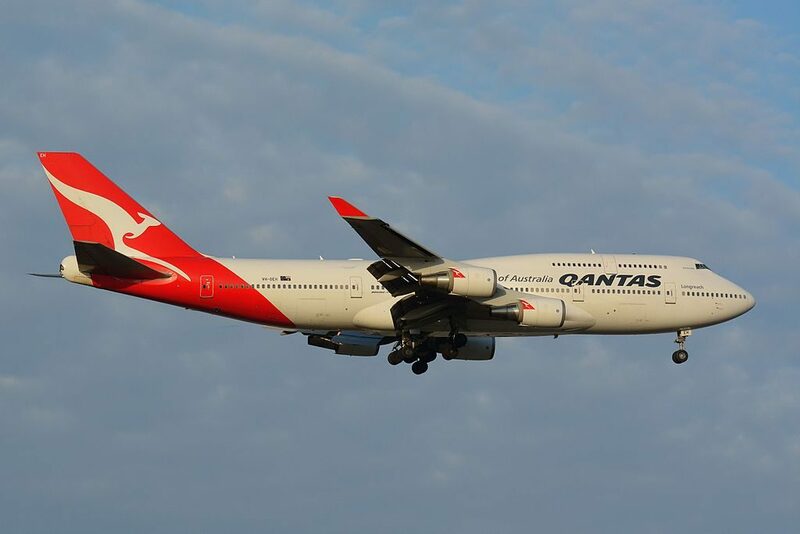 Qantas Fleet Boeing 747-400 Details and Pictures. 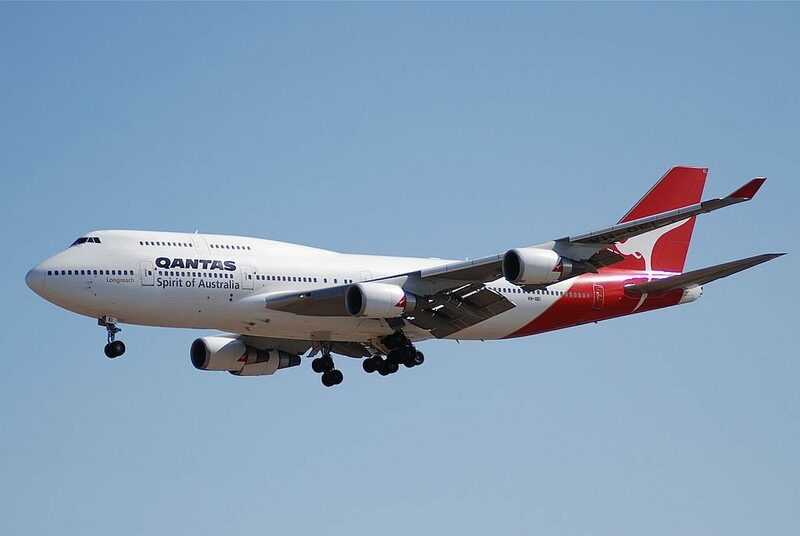 On current fleet, Qantas operates 8 wide-body jumbo-jet aircraft Boeing 747-400 aka “Queen of The Skies”. 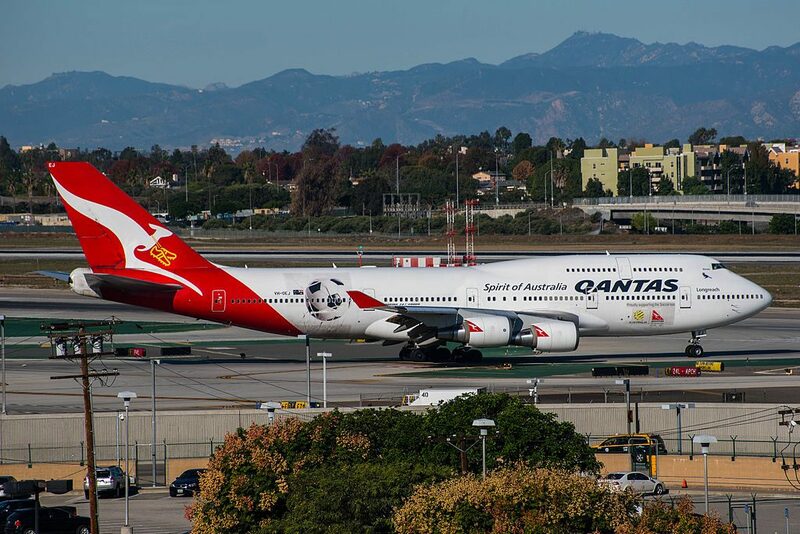 Qantas Boeing 747-400’s operate on selected routes including between Brisbane and Los Angeles, Los Angeles and New York, Sydney and Los Angeles. 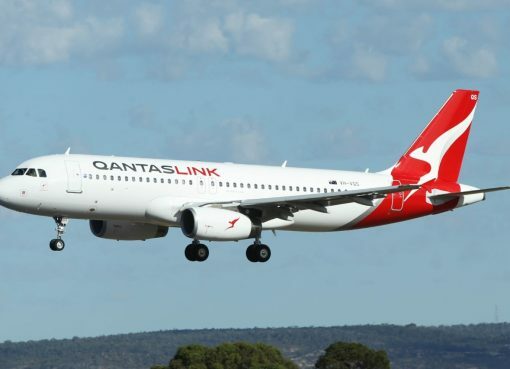 Sydney also connects with San Francisco, Santiago, Hong Kong, Tokyo (Haneda), Johannesburg and seasonally Sydney-Vancouver. 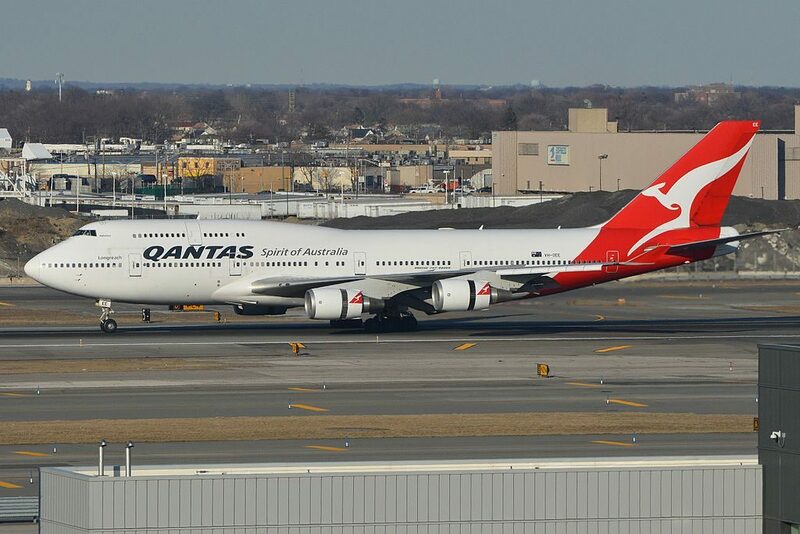 Qantas operates Boeing 747-400ER (extended range), and 747-400 longreach. 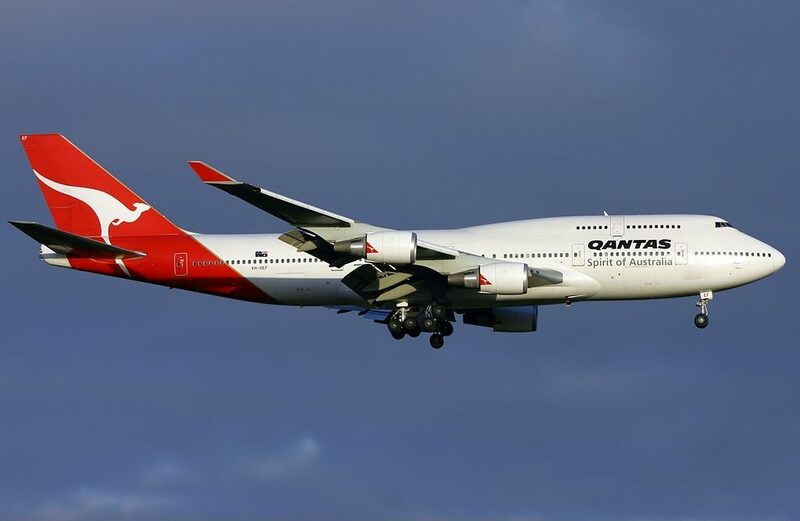 This jumbo-jet aircraft configured with 3 and 4 class cabin. 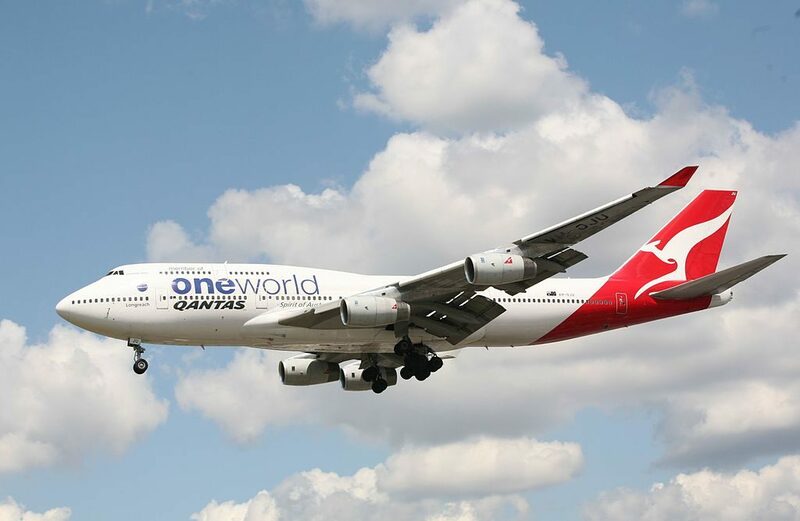 Enjoy exceptional service on Qantas Boeing 747-400 aircraft, which is aligned with their Airbus A380-800 offering. This airplane offers seats in three classes: business, premium economy and economy. Business class of the lower deck contains 32 flat bed seats that are divided into two sections. First sections consists of 4 rows of seats. All of them are standard only location of the galley and lavatory behind the seats of the 4th row may cause discomfort to passengers of these seats. The second section consists of 2 rows of seats that have 2-3-2 configuration. Proximity of the galley and lavatories and lack of floor storage during take-off and landing are the main disadvantages of the seats of the 23rd row. TV screens of these seats are adjustable allowing passengers watching them even while lying down. For passengers with infants the seats 23AB and 23JK have bassinets position of which may be bothersome. Behind business class seats 40 seats of premium economy class are located. The seats of the 29th row have no floor storage during take-off and landing. Position of the bassinets may cause discomfort to passengers of the seats 29DEFG. Passengers of the seats of the 31st row will take advantage of extra legroom. Among disadvantages of these seats: lack of floor storage during take-off and landing, reduced width as the tray tables are built-in the armrests making them immovable and noise that is coming from the galleys. Proximity of the galleys may also cause discomfort to passengers of B seats of the rows 32-34. Thanks to the position of the wall ahead passengers of the seats 35DEFG and 35JK will take advantage if extra space for their legs. However, these seats have no floor storage during take-off and landing and are narrower than standard as the tray tables are in the armrests. Economy class has 275 seats that are divided into three classes. The best seats of the economy class are considered the seats of the 38th row. These seats offer extra space for passengers legs. But as the armrests are immovable he width of these seats is reduced a little. Also these seats have no floor storage during take-off and landing. For passengers traveling with infants the seats 38DEFG offer bassinets. The seats 38HJK are crew seats. The main disadvantages of the seats 39HJK are: location of the crew seats in front, reduced width and lack of floor storage during take-off and landing. Proximity of the lavatories and limited recline will cause discomfort to passengers of the seats 40DEFG, 41ABC and 41HJK. Behind the exit row the second section of economy class seats is located. There are 11 rows of seats here. Other passengers tend to congregate in the area of these seats in order to visit lavatories and thus causing discomfort to passengers of the seats of the 46th row and 47DEFG. Also all these seats are narrower than standard as the tray tables are in the armrests and have no floor storage during take-off and landing. Passengers of the seats of the 46th row can get cold during the flight by the exits. The seats 46A and 46K are considered bad seats as they have no windows. These seats are very uncomfortable that is why they are assigned among the last. Passengers of the seats 46BC, 46HJ and 47DEFG will take advantage of extra legroom. The only disadvantage of the seats 55DEFG is limited recline. Close location of the galley and limited recline make the seats of the 56th row bad seats. The third section of economy class seats is located behind another exit row. Thanks to the exit row located in front the seats of the 58th rowoffer extra legroom. However, noise from the galleys may cause discomfort to passengers of these seats. Among other disadvantages: lack of floor storage during take-off and landing, reduced width. Also it can get cold by the exits during the flight. Passengers traveling with babies are often seated on the seats 63DEFG as they offer bassinets, position of which may be bothersome as well as position of the galleys in front. As the tray tables are in the armrests, the width of these seats is reduced a little. Lack of floor storage during take-off and landing is another disadvantage of these seats. AB and JK seats of the rows 70-72 are ideal for passengers traveling with a companion. A and K seats of these rows have extra space at windows side as there are no seats there. All B and J seats of these rows have less leg and storage room as entertainment equipment is stored under these seats. Close location of the lavatories is the only disadvantage of the seats 74D and 74G. Limited recline and close location of the lavatories make the seats 73AB, 73JK and 75DEFG bad seats. The upper deck contains 24 seats of the business class divided into two sections. The noise and the light from the lavatories will cause discomfort to passengers of the seats 11AB. Proximity of the lavatories will also represent a problem to passengers of the seats 11JK. For passengers with babies these seats have bassinet location. Adjustable TVs will enable passengers of the seats of the 11th row watching them in any position. All A and K seats of all the rows, i.e. rows 11-18 have storage lockers on the window sides. Passengers of the seats of the 16th row will take advantage of extra legroom. TV screens of these seats are in the armrests allowing to adjust them even for watching in lying position. The second version of Boeing 747-400 may transport 364 passengers in three classes: business, premium economy and economy. Business class of the lower deck contains 40 seats in two sections. Passengers with babied are often seated on the seats of the 1st row as they have bassinets. The second section of business class seats is located behind the exit row. For passengers travelling alone will be ideal the seats 5B and 5J as there are no seats next to them and there is a lot of storage space. The only disadvantage of the seats of the 8th row is close location of the stairs, lavatories and galleys. Premium economy class contains 36 recliner seats. Passengers of the seats 34AB will take advantage of extra legroom. 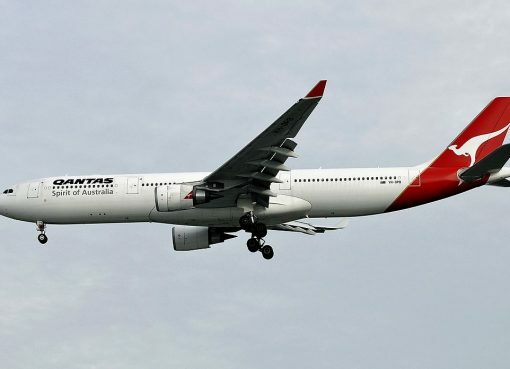 However, these seats have no floor storage during take-off and landing, are located close to the stairs, galleys and lavatories and are narrower than standard as the tray tables are built-in the armrests making them immovable. For passengers with infants these seats offer bassinets. Due to the position of the bulkhead the legroom of the seats 36DEFG is slightly reduced. Among other disadvantages of these seats and the seats 36JK are: close location of the galleys, reduced width and lack of floor storage during take-off and landing. Missing windows make the seats 38A and 38K bad seats. Because of the bulkhead located behind the seats of the 39th row are not reclining. Economy class contains 270 seats. Passengers of the seats of the 43rd row will feel comfortable thanks to the extra legroom they offer. But these seats are narrower than standard and have no floor storage during take-off and landing. These seats are first reserved for passengers with babies as they have bassinets. Location of the lavatories behind and lack of recline are the main disadvantages of the seats of the 44th row. Thanks to the exit row in front the seats of the 46th row have extra space for passengers’ legs. Other passengers tend to gather in the area of these seats while waiting to use lavatories and thus causing discomfort to passengers of these seats. As the tray tables are in the armrests the width of these seats is reduced a little. Also there is no floor storage for these seats during take-off and landing. The seats 55DEFG and the seats of the 56th row do not recline, the noise from the galleys located behind will cause discomfort as well. Behind the exit row another section of economy class seats is located. Extra legroom is the main advantage of the seats 58ABC. The main disadvantages are: close location of the galleys, reduced width and lack of floor storage during take-off and landing. Passengers traveling with infants are often seated on the seats 60DEFG and 60HJK as they offer bassinets. The armrests of these seats are immovable because the tray tables are in the armrests. That is why the width of these seats is reduced. Lack of floor storage during take-off and landing in another disadvantage of these seats. The noise from the galleys may also cause discomfort. Passengers of the seats 60HJK will feel comfortable thanks to the extra legroom. AB and JK seats of the rows 69-73 are ideal for passengers traveling with a companion. The seats 69AB and 69JK may feel cramped because of the change of configuration from 3 to 2. The only disadvantage of the seats 74DEFG is proximity of the lavatories. The seats 73AB, 73JK and 75DEFG are considered bad seats as these seats are not reclining and are located close to the lavatories. The upper deck contains 18 seats of the business class. Passengers of these seats have more attention from crew members and the atmosphere here is more private and quiet. Also these seats offer additional storage space at windows side. Close location of the lavatories may cause inconvenience to passengers of the seats 11B and 11J. For passengers with infants the seats of the 11th row have bassinets. Proximity of the stairs and galleys are the disadvantages of the seats 16JK. This airplane may accommodate 353 passengers in 4 classes: first, business, premium economy and economy. The lower deck contains seats of all 4 classes. All classes are divided from each other with exit rows. First class consists of 14 flat bed seats. The seats of the 1st row are considered good seats as they provide some privacy for passengers. However, passengers of these seats will fell discomfort when crew members will use closet located nearby. For passengers traveling with a companion will be ideal EF seats of the rows 2-4. Passengers traveling with infants are often seated on the seats 4A and 4K as these seats offer bassinets. Position of the bassinets provides mores storage space. However, these seats are often bumped by other passengers passing by and are located very close to the neighboring seats. Behind the seats of the first class 4 rows of business class seats are located. These seats have 2-3-2 configuration. TV of the seats of the 23rd row are adjustable that allows passengers of these seats watching them while lying down. But proximity of the galley and lavatory will cause inconvenience. Premium Economy class has 32 seats that are located in 4 rows that have 2-4-2 configuration. Close location of the lavatories, galleys and bar will cause discomfort to passengers of the seats of the 34th row. Also these seats have no floor storage during take-off and landing and are a little narrower than standard as the tray tables and personal TV are built-in the armrests. For passengers with babies the seats 34DEFG offer two bassinets. The seats 36A and 36K have no windows. Economy class may accommodate 255 passengers. The seats of the economy class are located in three sections. The best seats of the economy class are considered the seats of the 40th row. Passengers of these seats will take advantage of extra legroom. Among disadvantages: limited recline, lack of floor storage during take-off and landing and reduced width as the tray tables are in the armrests making them immovable. These seats are first reserved for passengers with senior frequent flyer status. The seats of the 41st row are considered bad seats as they are less reclining than standard, have limited under-seat storage and legroom because of entertainment equipment that is located there. Close location of the lavatories will also represent a problem. The second section of economy class seats is located behind the exit door and contains 11 rows of seats. Most of them have 3-4-3 configuration. The seats of the 46th row have the following disadvantages: proximity of the lavatories, reduced width as the tray tables and personal TVs are in the armrests making them immovable and lack of floor storage during take-off and landing. Protrusion of the exit doors limits legroom for passengers of the seats 46A and 46K. Passengers of the seats 46BC and 46HJ on the contrary will take advantage of extra legroom. But it can get cold by the exits during the flight. The seats 47DEFG are first reserved for passengers with infants as these seats have bassinets. Among disadvantages of these seats: limited legroom, proximity of the lavatories and galleys, lack of floor storage during take-off and landing and reduced width of these seats. The main disadvantages of the seats 55DEFG, 56ABC and 56HJK is limited recline and close location of the galleys. Also the seats 55D, 55G, 56B and 56J have less under-seat storage and legroom because of entertainment equipment that is stored here. Also passengers of the seats 56ABC may get cold by the exits during the flight. The third section of economy class seats has 18 rows of seats. The seats of the 58th row have no floor storage during takeoff and landing, are narrower than standard and are located close to the galleys the noise from which may cause discomfort to passengers of these seats. In addition, the seats 58B and 58J have less under-seat storage and leg room because of the entertainment equipment that is stored under these seats but the seats 58A and 58K have less legroom due to protrusion of the exit doors inside the cabin. But the seats 58BC and 58JK on the contrary offer extra space for passengers’ legs thanks to the exit row in front. Close location of the galleys is the only disadvantage of the C and H seats of the rows 59-61. Passengers traveling with babies are often seated on the seats 63DEFG as they have bassinets position of which may be bothersome for passengers of these seats as well as proximity of the galleys in front. Also these seats are narrower than standard as the tray tables are in the armrests making them immovable and have no floor storage during take-off and landing. Due to the curvature of the airplane the seats of the 69th row may feel cramped. Presents of entertainment equipment restricts under-seat leg and storage space of the seats 69B and 69J. For passengers who are travelling with a partner will be ideal AB and JK seats of the rows 70-73. All A and K seats of these rows have extra space at window side and do not have windows. All B and J seats of these rows have limited legroom and storage space under the seats as entertainment equipment is located here. The main disadvantages of the seats 74D and 74G is proximity of the lavatories and restricted under-seat leg and storage space. Limited recline and close location of the lavatories make the seats 75DEFG bad seats. The upper deck of the airplane consists of 6 rows of business class seats that are divided into two equal sections per 3 rows in each and have 2-2 configuration. Close location of the lavatory will represent problem for passengers of the seats 11AB. TV screens of the seats of the 11th row are adjustable providing passengers of these seats with opportunity to watch them while lying down. Position of the bassinet will also cause discomfort to passengers of the seats 11JK. The lockers of the seats 11A and 11K are smaller than the others. A and K seats of the rows 12-13 and 16-18 have storage lockers on windows’ side. The best seats of this part of the airplane are considered the seats of the 16th row. Passengers of these seats have extra space for passengers legs, however position of crew members’ seats in front may cause discomfort. TV screens of these seats are built-in the armrests and are adjustable. Proximity of the galley and stairs behind is the only disadvantage of the seat 18B. Audio. 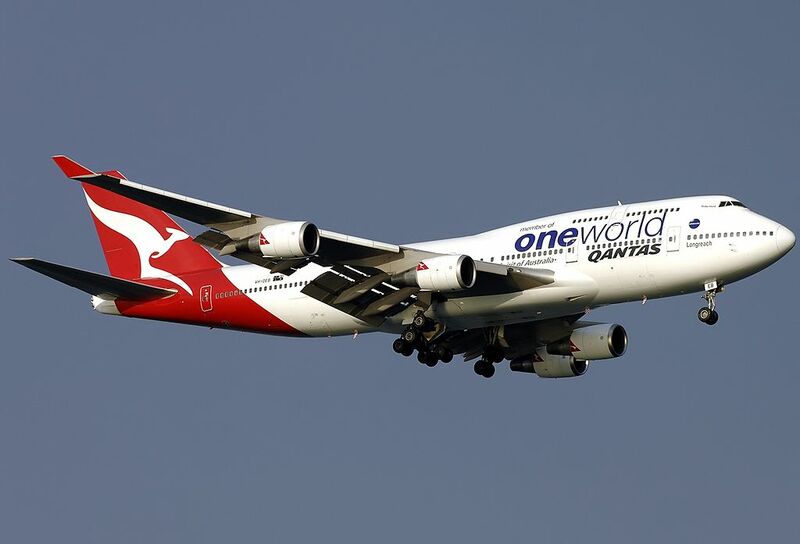 The Boeing 747-400RR offers 1000 CDs, a selection of audio books and 20 radio channels. Video. 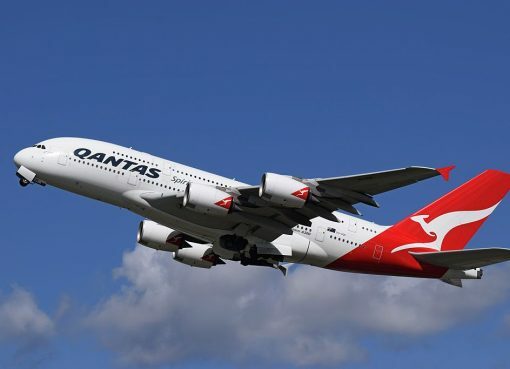 Qantas Airways’ international flight entertainment system includes 100 movies, over 500 television programs and 80 games. You also have access to Qantas Airways’ Lonely Planet interactive destination guides and Kids Zone. AC Power. Power outlets are available in Business and Premium Economy on selected international B747-400s. 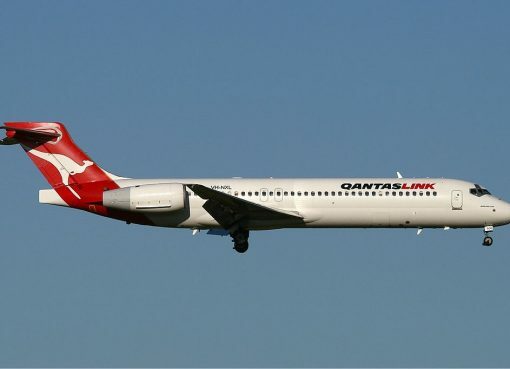 This aircraft provides 110V AC (60 Hz) power and accepts most household power plugs including: Australian 2 or 3 pin, European 2 pin, Japanese 2 or 3 pin and USA 2 or 3 pin. Customers using UK 2 or 3 pin plugs must use an adapter. 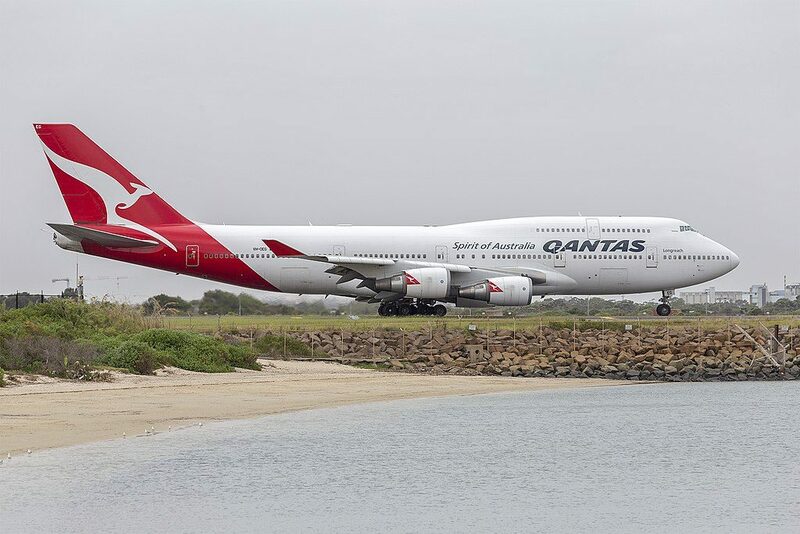 Thanks to visiting AirlinesFleet.com and read article : Qantas Fleet Boeing 747-400 Details and Pictures.